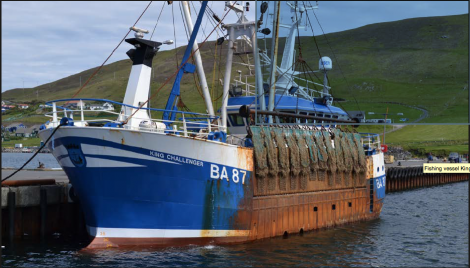 A SIGNIFICANT culture change in crew safety has taken place in at least some fishing boats after the death of a scallop fisherman off the coast of Shetland in 2016. The King Challenger berthed at Blacksness Pier, Scalloway. A fatal accident inquiry at Lerwick Sheriff Court heard on Wednesday that Kirkudbright based West Coast Sea Products had made the wearing of lifejackets mandatory for its crewmen after the death of 34-year-old Scott Rennie from Newton Stewart. Mr Rennie fell from the scallop dredger King Challenger as he tried to unhook damaged gear on the ‘tipping deck’ of the 21metre long boat on 23 June 2016. In what Sheriff Ian Cruickshank called an “incredibly brave” effort to save Mr Rennie, fellow crewman Darren Rennie, who is no relation, dived into the sea to get a line around his unconscious crew mate. Mr Rennie died without being revived despite what an earlier Marine Accident Investigation Branch (MAIB)report said was a very quick evacuation to hospital by helicopter. Giving evidence, Maritime and Coastguard Agency inspector Andrew Philips said that he was satisfied the firm had undertaken a root and branch examination of safety and had taken on board the lessons learned. Within a few days of the tragedy it had banned crewmen from working on the tipping decks of any of its four boats and later introduced the mandatory wearing of lifejackets on board deck and increased the frequency of safety drill which had previously been given lip service. Flotation suits were now also supplied just in case anyone else had to go overboard in the event of a rescue. The investigation also heard evidence from four fishermen speaking via video link from Dumfries Sheriff Court. None of the crew had been wearing lifejackets at the time and Darren Rennie had to hurry below decks to put one on before diving into the 10.5 degree sea. Douglas White, 59, who is a share fishermen and relief skipper for West Coast Sea Products, said that fishermen were “natural liars” when it came to observing health and safety, but lifejackets on deck were enforced within two days of the accident. Along with the other fishermen who spoke, White said that he seldom wore a lifejacket, despite being a Seafish trained instructor, but that changed after the accident, an admission that was shared by the rest of the fishermen. A Seafish safety manual that was to be carried onboard all the firm’s vessels, had no provisions for working on the vessel’s dredges while they were hauled alongside the ship and made secure by a tugging winch. This was because of the many and varied circumstances which could affect this operation. White, who was not on board the vessel on the day of the accident, said that conversations with Derek Smith, the mate on the vessel, who he knew well, raised doubts that Rennie had simply fallen overboard as appeared to be the case from initial accounts. Instead, they had speculated, he might have been knocked overboard by the three-tonne dredge rig, which would need little movement to knock someone off balance. This movement could have been allowed by slight slackening off of the tugging winch in order to allow enough slack in the gear to handle the individual dredges. The question was not put directly to crewman Iain Bell who was operating the portside winches from the wheelhouse, but he said in his evidence that he clearly saw Rennie tumble into the sea and when asked where his own hands were at the time, replied that they were by his sides and nowhere near the winch controls. He had immediately raised the alarm by shouting man overboard and alerting the rest of the crew on deck. Smith, who was operating the starboard winches, had sounded the vessel’s alarm and went on deck to throw a life belt and another flotation device to Rennie, who was losing consciousness and was only able to grasp a lifebelt for 15 or 20 seconds. White, who has 40 years experience of fishing, said that from his reading of a MAIB report on the accident and his experience with Seafish, there appeared to be little understanding of scallop dredging in either organisation. The inquiry continues in Lerwick on Thursday.